As we celebrate Easter, we invite you to join with us for any, and all, of the events being planned at Long Creek Church for this incredibly meaningful time of year. See the details and flyer on this post. April 20 Easter Saturday – Easter Egg Hunt from 10 am – 12 noon for parents with their children aged 2-12. Fun games, music, face painting. So that we can be well prepared we are requesting that you RSVP by April 14 either by calling the number, or sending a message to the email, mentioned below to advise of of the number of children who will be attending and their ages. Please note: for those children with sensitivities to gluten or other allergens, there will be an opportunity to trade in treats. Please mention this sensitivity when you call to register. Sunrise Gathering and Breakfast at 6:00 am followed by Potluck Breakfast at the church about 6:30 am. 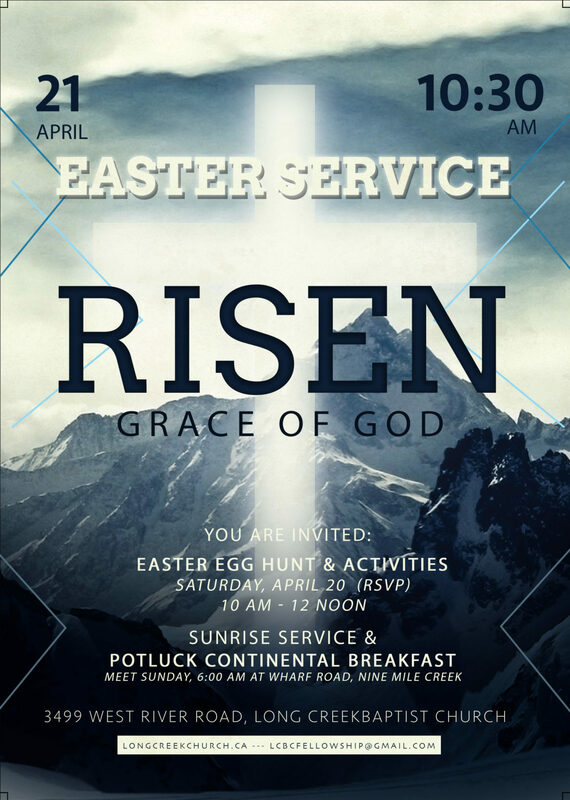 Gather at Wharf Road, Nine Mile Creek for a time of celebration and worship as we watch the sun rise together and think about what it must have been like on that first Easter morning! He. Is. Risen! Sunday Worship Service at 10:30 with special presentations in word and music. Previous Event LinkGood FridayNext Event LinkEaster Egg Hunt – a “go” for this morning! Everything is indoors!